Early 20th century set of tortoise shell style lorgnettes, leather case, neck lanyard, and original box. 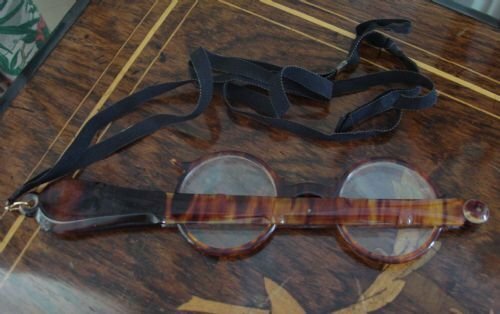 Early 20th century complete set of "tortoise shell" style lorgnettes, adjustable ribbon neck lanyard, leather case, and original box as purchased from Pictons Ophthalmic Opticians on Union Street in Bristol. Lorgnettes were used for reading and pursuits like opera and the races, for those who needed spectacles, but either didn't wish to wear them regularly, or wanted to make a certain style statement. They were meant to fold flat nicely to place in handbag or pocket. This is a lovely pair, and comes with all its original pieces. The round glass lenses I estimate would fall into the 2.5 to 2.75 magnification range. They very neatly fall into the long shaped handle with loop on end for the attached lanyard to use to wear around the neck for convenience. Size-7 inches long by 1 5/8 inches closed; 11.5 inches fully extended straight. Weight-130 grams including case and box. These would be lovely to use or display on an antique table next to or on top of a leather bound book. A nice piece of history in very good condition. 19th century Victorian opera glasses by J.H.Steward Co., Cornhill, London, with case. 19th century Victorian opera glasses with makers marks of J.H. Steward Co., Cornhill, London, and including the original fitted and shaped case. These leather and aluminium opera glasses are in perfect working order. The original leather and silk lined case (which is often missing) is a bit worn from use. There is a scrolling monogram of the original owner between the eyepieces. This is the perfect accessory for seeing the opera or races at closer range, or to use in a lovely display on table or desk. 19th century original brass gentlemans library telescope on folding stand by Hillum of London. 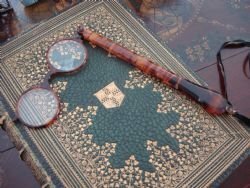 From a large home in Sussex, England, where antiques were collected by the family over many generations, an early 19th century period English refracting gentleman's library telescope on a folding cabriole leg table top stand. Engraved to the objective edge "J. Hillum, 109 Bishopsgate Street, within London." Bishopsgate Street was known as the home of makers of fine scientific instruments during this period. Joseph Hillum was an optician who also made barometers, thermometers and other intstruments. This all brass period refracting telescope is a wonderful instrument that wealthy gentleman and ladies of the period kept on their library table at home, and often transported to their holiday destinations. The eye tube has a draw tube used to adjust the magnification. The telescope has thumb wheel rack & pinion fine focus. This fine, 31 in. long (with draw tube fully open) bodied telescope, with removable dust cap to the objective, stands only 13.25 inches high which puts it in the class of “library telescope,” which is a smaller instrument than the much more common larger telescopes. The telescope has a two inch diameter objective and sits on a compass joint atop the removable cabriole leg tripod stand which folds for storage. The stand is 9.75 inches wide open. For transport- The stand separates from the telescope and folds. Size-closed is 27.75 inches long by 2.25 inches wide. Open, it extends to 31 inches long. The stand closed is 2.75 inches wide by 15.5 inches long. The optics are in full working condition, and there are additional included eye pieces and caps as pictured. The whole instrument is in very good original antique condition allowing for some marks commensurate with its use over many years. With original lacquered finish. A really lovely antique instrument to both use and also proudly display as a decorative accessory. An excellent gift for the gentleman who has almost everything! Item will ship from the USA. There are few things more attractive and desirable than an antique telescope. Birmingham 1891 Victorian solid silver spectacles case by famous maker George Unite. 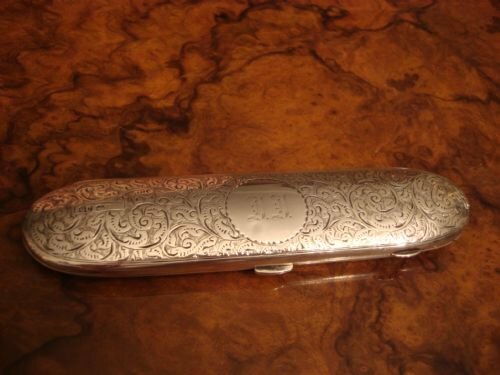 Birmingham 1891 English hallmarked solid silver spectacles case with all over bright cut scroll engraving to both sides, and made by renowned and very collectable maker George Unite. The lovely oval shaped case is lined with the original velvet, has a full length hinge, and push sprung catch. Size-6 inches long by 1.5 inches wide, exterior; 5 5/8 inches long by 1 1/8 inches wide, interior. 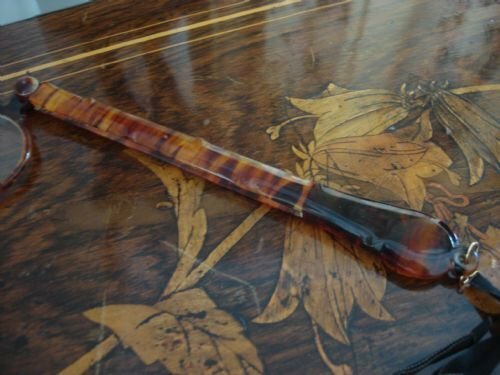 A lovely and unusual seldom found Victorian piece in very good condition. 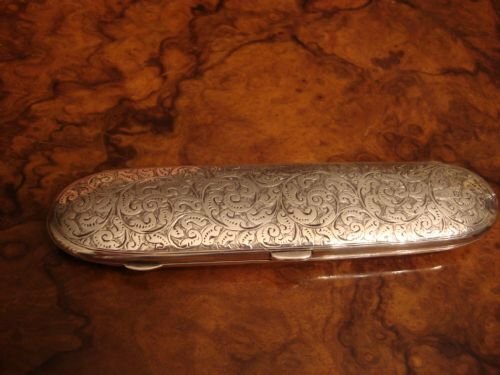 Birmingham 1912 solid silver shaped spectacles case including original spectacles. 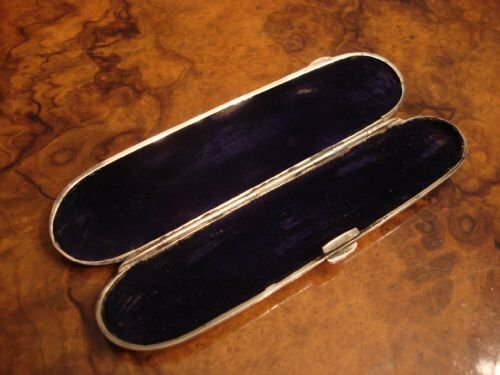 Birmingham 1912 very unusual English hallmarked solid silver dome shaped top spectacles case with curved top, strong full length spring hinge, original cobalt blue velvet lining, and made in a very heavy gauge of silver. 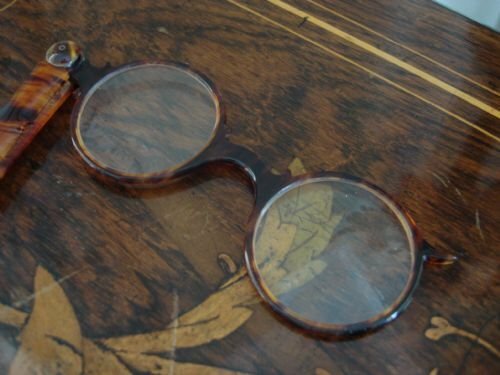 Includes pair of original spectacles. Size-4 3/8 inches wide by 1.75 inches deep. Weight-90 grams without spectacles, or 110 grams with spectacles. 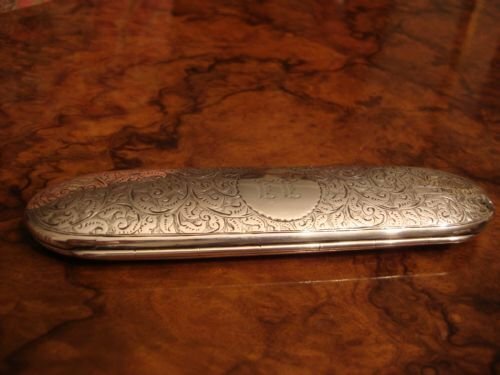 A rare and lovely case to use or display, in very good condition. 19thC Victorian mother of pearl and silver folding lorgnette. 19th century Victorian mother of pearl and solid silver (unmarked) lovely folding lorgnette. Beautifully shaped mother of pearl case with silver plaque to middle of each side. 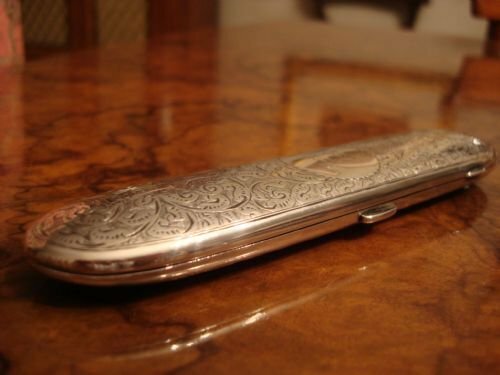 The case opens by pulling open a catch on the side to reveal a folding pair of silver spectacles. With hanging ring meant to carry on a chatelaine or a chain around the neck, these are perfect for an evening bag. Size-2.75 by 1.25 inches closed or 6.25 inches fully extended. Spectacles alone are 3.5 inches long. Wonderful purchase for the collector of objects of virtue, to use as part of a display, or to use for their original purpose. It is very unusual to find mother of pearl lorgnettes that are not cracked chipped or broken. This example is in very good condition. 19thC Victorian mother of pearl and brass opera glasses with original case. 19th century Victorian mother of pearl and brass opera glasses with original fitted velvet case. In perfect working order, the opera glasses are in very good condition, while the case is a bit worn. 4.25 inches wide by 2.25 inches high. A lovely and useful antique piece for the opera, the races, or display. Victorian French snakeskin, ivory, and brass opera glasses and original case. Victorian 19th century French snakeskin and brass opera glasses, having ivory eye pieces, and including the (often missing) original leather velvet lined case. The opera glasses are in very good condition, while the carrying case is a bit worn from use. Size-4.25 inches wide by 2 5/8 inches high. In perfect working order, these lovely opera glasses are wonderful for seeing the opera or races at closer range, or to use as a pretty display. 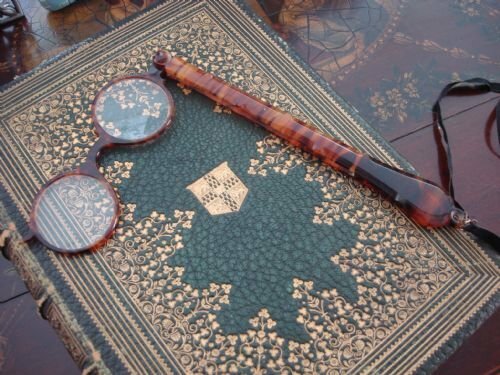 Victorian period English papier mache spectacles case, in the Oriental taste, with tortoiseshell spectacles. Victorian papier mache spectacles case decorated with gilt chinoiserie Oriental design in very good condition. Lined with velvet. A very interesting and beautiful display piece or collectable.